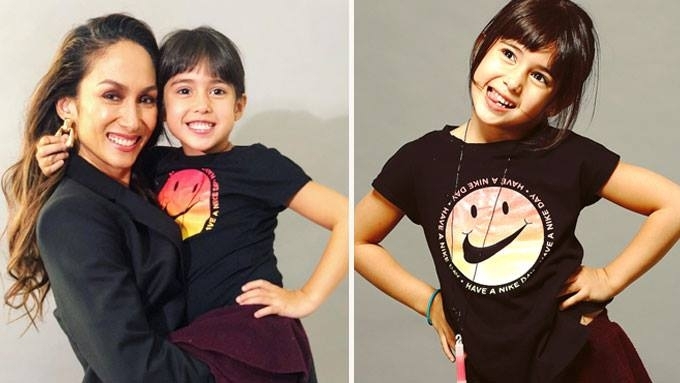 Ina Raymundo's youngest daughter Minka seems like the most likely heir to her mom's showbiz throne. At five years old, her looks, talent and natural charm are earning her a lot of attention on social media. Ina Raymundo and husband Brian Poturnak undoubtedly have artistahin kids—Erika, Jakob, Anika, Mikaela, and Minka. Although none of them are currently in the entertainment scene, the celebrity mom revealed that she’s often asked if she would allow them to join showbiz in the near future. So far, five-year-old Minka is the only one who has shown interest in becoming an actress. Interestingly, when Ina was pregnant with Minka, she was fond of watching zombie flicks. That's why during last year’s Halloween, portraying a zombie was the top choice. Well, if you have a mom who’s an actress, it wouldn't be surprising if you'd ham it up for the camera naturally, right? In fact, Ina called Minka a “scene stealer” in one of her shoots. Part of her caption reads, “So I brought this cutie patootie to my photo shoot yesterday and she stole the show! Scene Stealer ???? ?? So I brought this cutie patootie to my photo shoot yesterday and she stole the show! She wanted her photos to be taken. She demanded it.???? Yup, she’s definitely got it and to answer the most common questions I get from people around me, “Are you going to let your children enter show business?” “Who among your kids want to join showbiz?” Yes, I will allow if they really, really want to do it and they’re at an appropriate age to make such a decision. It’s going to be Minka. She’s so happy in this environment.?? #minkamanika #swipe?? Called “little doll” by her proud mom, Minka is athletic as well. She plays baseball like her Kuya Jakob. At two and a half years old, she’s been “bugging” her mom that she wants to work out. But wait. There's even more to this cute bundle of energy. Did you know that Minka can play the piano too? Isn’t she the future Liza Soberano?